This AI-driven home security camera can tell you who is in your home—just ask it. Reviewing the recordings your security camera makes can answer the question “Was there anybody in my home while I was away?” The problem is that you need to review everything it recorded while you were gone to find out. With the AI-driven Lighthouse security camera, you literally ask if anyone was in your home while you were gone. Update: Lighthouse AI has ceased operations, according to this post on the company's website. Like a lot of home security cameras, the Lighthouse provides a 1080p live stream, two-way talk, night vision, real-time activity alerts, and an onboard siren for scaring off intruders. It also uses facial recognition to distinguish between pets and people and to identify recognized individuals by name. But its natural-language processing engine sets it apart from the sea of samey offerings, allowing you to search recorded footage and set alerts by speaking or typing questions and commands. Setting up the Lighthouse is quick and easy. Once you download the Lighthouse app and create an account, the app prompts you to connect to the camera via Bluetooth and connect it to your Wi-Fi network. The camera needs to be plugged into an electrical outlet, so it’s best used indoors—it’s not weatherproofed for the outdoors anyway—though its 9-inch height is pretty tough to conceal among your furnishings. The Lighthouse includes a 3D sensor that helps reduce false alarms. The live feed, displayed at the top of the app, is sharp with rich colors. The 112-degree viewing angle is on the narrower end of the wide-angle lenses we commonly see on cameras now, but that means there’s little fisheye distortion. Night vision, courtesy of four infrared LEDs, activates automatically in low light and provides adequate illumination in a typical living room. The camera doesn’t have a zoom function, though, so there’s no way to get a closer look at an object or activity when you’re viewing the feed. The camera incorporates a 3D time-of-flight sensor—a carryover from the Lighthouse founders’ Ph.D. work on self-driving cars at Stanford University—for enhanced computer vision. According to Lighthouse, this sensor measures the time it takes for emitted light to return to the Lighthouse after bouncing off objects in the environment, allowing it to create a 3D model of the scene it’s viewing. Because the camera only triggers alerts based on 3D motion, it purportedly eliminates the false alerts common to cameras with 2D sensors, which are often set off by lights and shadows. The 3D sensor also helps the AI engine to distinguish between adults, children, and pets. The Lighthouse starts building a catalog of faces as soon as you power it up. You identify these using a “tag faces” feature that presents you with any new faces the camera encounters and lets you assign them names. Typically, facial recognition takes a few weeks of repeating this process over and over to learn who’s who, but the Lighthouse started recognizing my kids, my wife, and me immediately. You can use voice commands to search video contextually or create activity alerts. All this data enables the Lighthouse to respond to your questions and commands. 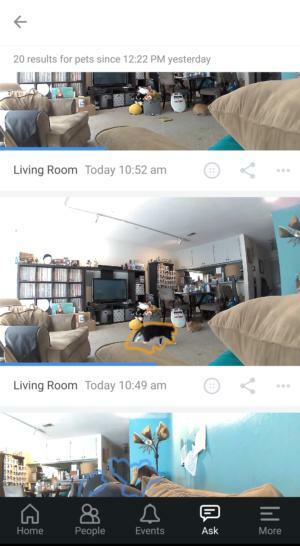 For example you can search recorded footage by saying “What did the cat do last night?” or “What did Tom do while I was gone?” After a brief search, the app will display time-stamped thumbnails of all the video clips containing the cat and Tom respectively, recorded in the designated time period. In these clips, the subject is surrounded by a colored halo—blue for humans and orange for pets—so you can easily identify them and track their movement. You can also use voice and typed commands to create custom notifications (Lighthouse calls them “pings”) to alert you when the camera sees a pet, a family member, or an unrecognized person. “Ping me if you see anything between 10pm and 6am,” and “Tell me if you see anyone new with the kids when I’m not there” are two of the ones I used, but the possibilities seem limited only by your imagination. 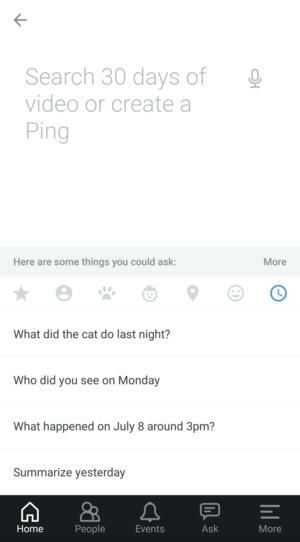 The app includes one default Ping to alert you to any person-related activity while all invited users are away. The camera uses your phone’s location service to determine when you’re home and away, so it’s best to have everyone in the household create an account (you can invite people within the app). The Lighthouse generally had no problem identifying my family members and alerting me to their activity. The facial recognition was surprisingly accurate from the get-go and only improved with continued use. The ability to distinguish between adults and children—which Lighthouse told me during a briefing uses age 10 as the dividing line—was also spot on. The AI wasn’t flawless: One search for video showing our cats returned more than 30 clips, only one of which contained an actual feline. In the rest, it misidentified various family members—and even the back of my head—as a cat. But this is to be expected when the system is learning about your environment, and it’s less likely to occur the longer you use the camera. The Lighthouse app is designed extremely well. On the home screen beneath the live stream panel are controls for the siren, two-way talk, and turning the camera on and off. Any registered users currently home are displayed below this. Next is a “last seen” collection of buttons that let you see the last 24 hours of recordings of adults, children, pets, and unknown persons, as well as a time-daily recap of all activity. Further down is a panel with all your Pings and toggles to enable/disable each, and a daily activity bar graph broken down by hour. Along the bottom of the home screen are several buttons that take you to other parts of the app. The People button displays a screen with all the people in your facial recognition database. Events opens a time-stamped list of all alert-triggering activity. 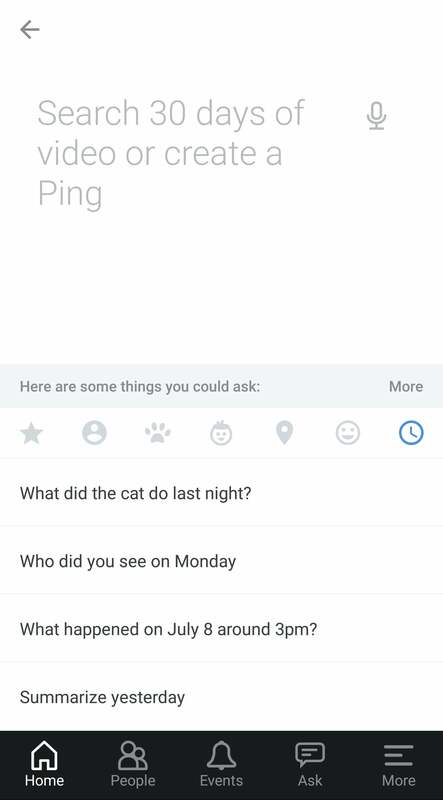 The Ask button takes you to the screen where you can search video or create Ping using voice commands. And the More menu lets you add additional cameras, change your location and access help topics. The Lighthouse can identify pets and highlights them in an orange halo. 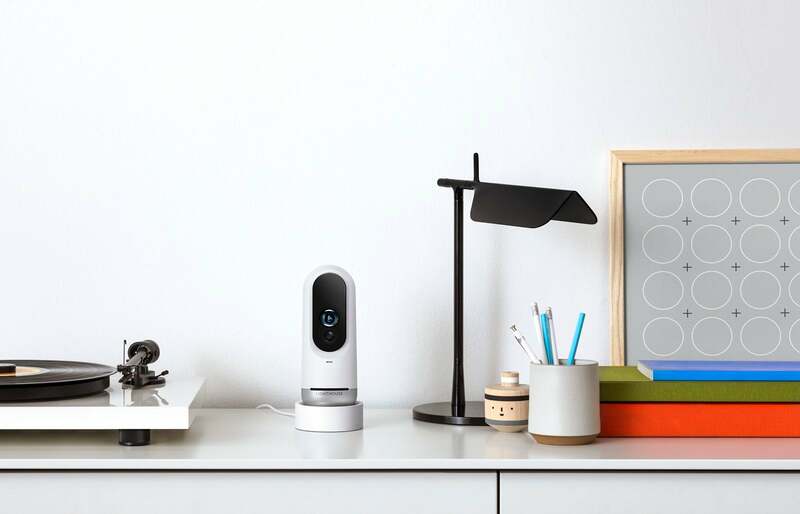 At $300 dollars, the Lighthouse already costs a good deal more than many premium-feature security cameras, so it’s important to note you don’t get access to all its features with the hardware purchase. A $10-per-month subscription is required to unlock facial recognition, customizable Pings, people and pet detection, and the ability to tell the difference between children and adults. A subscription also bumps the 24 hours of video history you get out of the box up to 30 days. Alternately, you can get a lifetime AI Service plan for a one-time fee of $200 per camera. There’s no question the Lighthouse is chock-full of cool technology, and that the ability to use your voice to search video footage and create intelligent alerts is incredibly convenient. 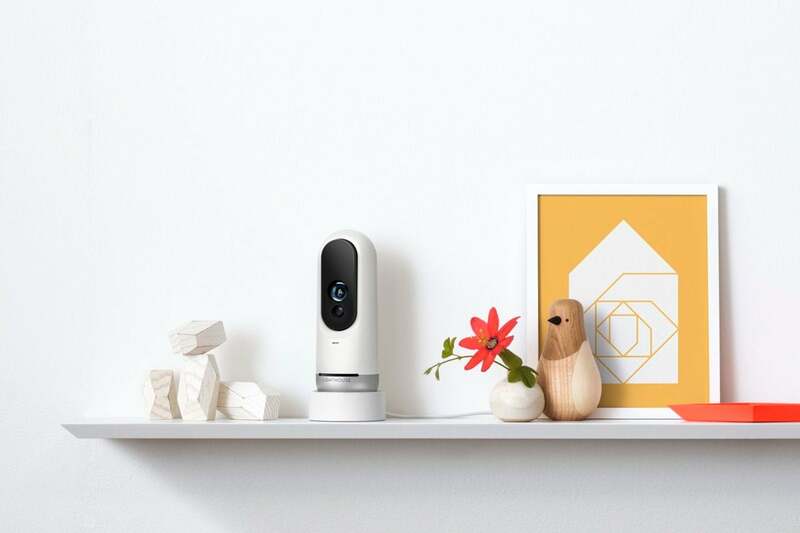 While any user will find much to love about the camera’s AI capabilities, the child and pet detection make it particularly suited to families will all kinds of home activity worth monitoring. It really comes down to price, then. Three bills plus the not-insignificant cost of the AI service subscription will tough to justify for many budget. The Lighthouse is a solid security camera with a powerful AI that makes it easy to track your household activity.